In a new paper by Woolley & Fishbach (2016) the relation between intrinsic motivation and immediate rewards is tested. Specifically, they test their hypothesis that immediate rewards can strengthen intrinsic motivation. The paper described four studies which support this hypothesis. In study 1 they found that the more an activity yields immediate rewards, the more it is experienced as intrinsically motivating. In study 2 they found that immediate rewards increased intrinsic motivation. 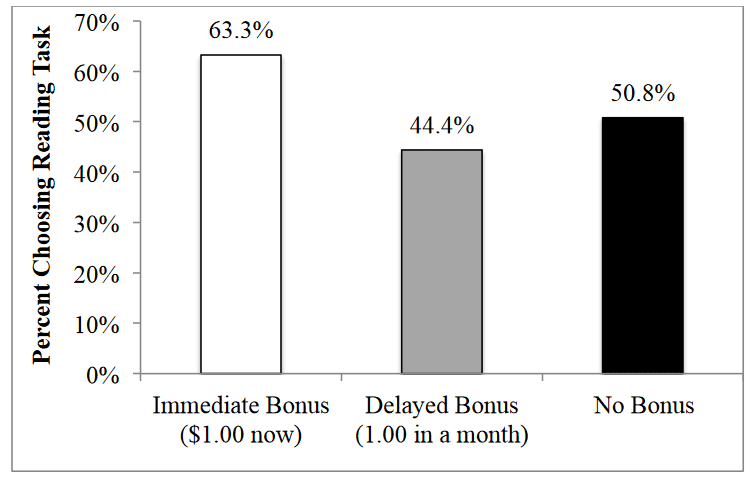 In study 3 they found that immediate rewards made it more likely that the task was continued. In study 4 they found that only intrinsic and not extrinsic motivation was increased by immediate rewards. This article forces us to think because much previous research has demonstrated that rewards can undermine motivation. At the same time, I think there are some reasons to be skeptical about the findings in this new paper. Two examples. Firstly, the way intrinsic motivation is measured is unusual and dubious. Secondly, the studies have been conducted in a non-controlled environment (on Mturk). I think we should be reluctant to accept these findings and not translate them into practical applications too quickly.